Page Summary: Clips, Quotes & Links to 40+ Science News Reports on the Association of Meat Consumption with Higher Rates & Risks of Diabetes & of Lowered, Decreased Risks from Plant-based (Vegan, Vegetarian) Diets. Dr Michael Greger MD’s clip “Plant-Based Diets for Diabetes” is at https://www.youtube.com/watch?v=HRTKfRXwBTg Summary: “A plant-based diet beat out the conventional American Diabetes Association diet in a head-to-head randomized controlled clinical trial, without restricting portions, no calorie or carb counting. A review of all such studies found that individuals following plant-based diets experience improved reductions in blood sugars, body weight, and cardiovascular risk, compared with those following diets that included animal products. Regards type 2 diabetes (T2D) a study of 40475 people found that “high animal protein and fat was associated with an increased risk of T2D…” of 37%; hazard ratio (HR) of 1.37 for “top compared with bottom quintile”. In contrast a “high score for vegetable protein and fat was not significantly associated with the risk of T2D overall but was inversely associated with T2D in men aged <65 y.” The risk was reduced by 22%; an HR of 0.78. That means the vegetarians had around 27% lower rates of diabetes than the non-vegetarians. Excerpts: “The relationship between fish consumption and diabetes risk may be due to toxic pollutants that build up in the aquatic food chain… In the past two years, six separate meta-analyses have been published on the relationship between fish consumption and type 2 diabetes. The whole point of a meta-analysis, though, is to compile together the best studies done to date, and see what the overall balance of evidence shows. The fact that there are six different ones published recently highlights how open the question remains. One thread of consistency, though, was that fish consumers in the United States tended to be at greater risk for diabetes. 2018 Dr Greger article “Plant-Based Diets Put to the Test for Diabetes” – excerpt: “A plant-based diet beat out the conventional American Diabetes Association diet in a head-to-head, randomized, controlled clinical trial, without restricting portions and without calorie- or carb-counting. A review of all such studies found that those following plant-based diets experience improved reductions in blood sugars, body weight, and cardiovascular risk, compared with those on diets including animal products. Cardiovascular risk is what kills diabetics the most. They’re more likely to get strokes, more likely to suffer heart failure. In fact, “[d]iabetes has been proposed as a coronary heart disease risk equivalent, which means diabetic patients without a history of coronary disease have an equivalent risk to that of nondiabetic individuals with confirmed heart disease. Including all participants, HbA(1c) (A1C) decreased 0.96 percentage points in the vegan group and 0.56 points in the ADA group (P = 0.089). Excluding those who changed medications, A1C fell 1.23 points in the vegan group compared with 0.38 points in the ADA group (P = 0.01). Body weight decreased 6.5 kg in the vegan group and 3.1 kg in the ADA group (P < 0.001). Body weight change correlated with A1C change (r = 0.51, n = 57, P < 0.0001). Among those who did not change lipid-lowering medications, LDL cholesterol fell 21.2% in the vegan group and 10.7% in the ADA group (P = 0.02). Research of Western populations have reached similar conclusions; a 2011 Harvard study found that a daily serving of red meat increased the risk of adulthood diabetes by 19 percent. It’s likely that dietary haem iron found in red or dark meat causes the health hazard, according to Koh Woon Puay, lead author of the study and professor at the Duke-NUS Medical School. Although the body quickly absorbs haem iron, excessive levels of the nutrient can damage tissues, including those that produce insulin in the pancreas—which could lead to diabetes. This site features a page about the health risks of consuming eggs including numerous science reports on the higher rates of type 2 diabetes associated with moderate consumption of eggs. A 2014 article in the journal named Nutrients is titled “Meat Consumption as a Risk Factor for Type 2 Diabetes”. The Adventist Health Study-2 included 60,903 Adventists… the odds ratio of a diagnosis of type 2 diabetes among meat consumers remained approximately twice that of individuals avoiding meat. Those who consumed meat less than once per week or who limited their meat consumption to fish also remained at elevated risk, albeit not so high as for those consuming all types of meat on a daily basis. In the Nurses’ Health Study I, two major dietary patterns were identified among the 69,554 participants: a “Western” dietary pattern, defined by higher intakes of red and processed meats, sweets, and desserts, french fries, and refined grains, and a “prudent” dietary pattern, characterized by higher intakes of fruits, vegetables, legumes, fish, poultry, and whole grains. After adjustment for age, family history of diabetes, calories, physical activity, body mass index, and other factors, those in the highest quintile of the Western pattern had a 49% increased risk of developing diabetes during 14 years of follow-up, compared with those in the lowest quintile. After adjustment for the Western dietary score, the associations between meat intake and diabetes risk remained significant; the relative risk for each added daily meat serving was 1.26 for red meat and 1.38 for processed meat, suggesting, in the study authors’ words, “that these foods are associated with diabetes risk independently of the overall Western pattern”. In the Nurses’ Health Study II, including 91,246 women followed for eight years, consumption of processed meat five or more times per week was associated with increased risk of type 2 diabetes… For red meat consumption 5 or more times per week, compared with <1 time per week… the relative risk of type 2 diabetes was 1.59… These studies indicate that, while a Western dietary pattern is associated with diabetes risk, meat consumption increases diabetes risk independently of dietary pattern. “Simple Care for Diabetes” by Dr John McDougall, an excerpt: “Drug therapy has consistently failed patients with type-2 diabetes, and their well-intended doctors, making the search for an alternative treatment imperative. Since the rich Western diet is agreed to be the cause of this epidemic, should diet not be the first place to look for the prevention and the cure? Written reports on the benefits of a low-fat, high-carbohydrate, plant-food-based diet on type-2 diabetes date back to at least 1930. Several published studies demonstrate how type-2 diabetics can stop insulin and get off diabetic oral medications with a change in diet. One goalpost is weight loss to the point of normal body weight, at this time the blood sugars of most patients diagnosed with type-2 diabetes will normal, and then everyone will agree that no further treatment with medications is needed. By great good fortune, this same low-fat, no-cholesterol diet successfully used for diet-therapy for diabetes has been shown to prevent and treat heart and kidney disease, and prevent many common forms of cancer. Heart disease accounts for 70% of the deaths in diabetics, diabetes is the number one cause of kidney failure, and cancer is more common in diabetics. 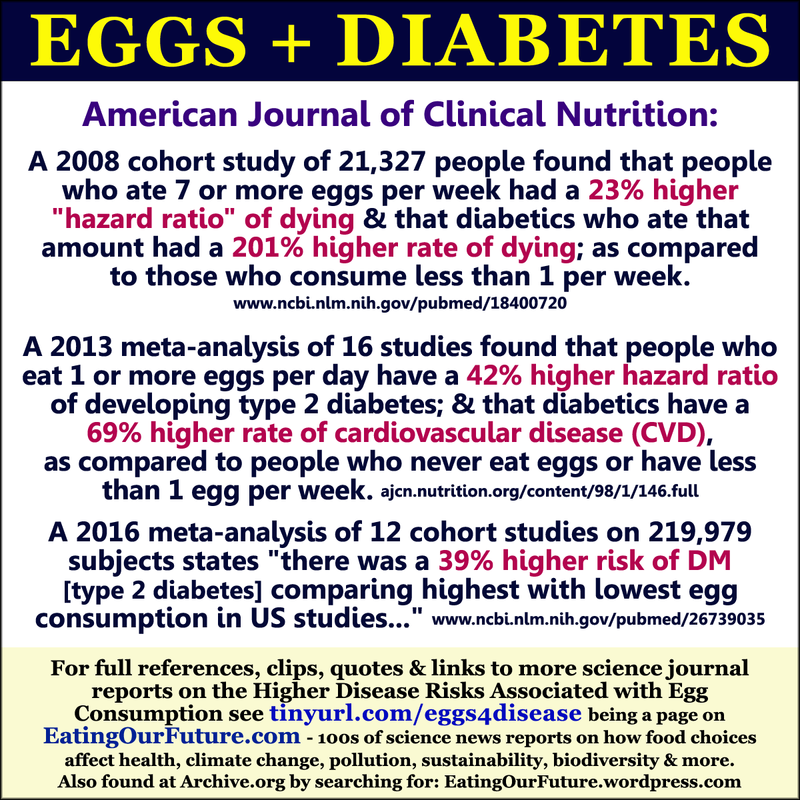 Click the link to go to this site’s page of science reports on the Higher Risks & Rates of Disease associated with Eating Eggs, including Diabetes.